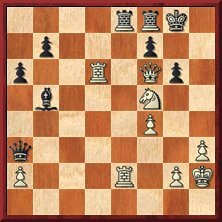 Radjabov played well in this rapid event, winning in Radjabov-Karpov and getting a winning position in Kasparov-Radjabov, even if the latter eventually ended up with a draw. Apart from against Karpov, Radjabov also won against Bareev and Zvjaginsev. Radjabov was undefeated in his eight games in the Greek Team Championship, where he faced some strong opposition in the form of Azmaiparashvili and Atalik. One of his wins came in Gelashvili-Radjabov. Radjabov impressed by eliminating Ivanchuk, Svidler, Beliavsky and Akopian to reach the final of this rapid minimatch knockout event. He was eventually beaten by Kasparov (1.5-0.5). A plus score in Sarajevo, even with Shirov, was a very good result for the young Radjabov. In Radjabov-Kozul he got the chance to play against the King’s Indian Defense instead of playing it himself, and scored an impressive win.